Reviews, Thank you Notes, Emails, Testimonials. "Hello Tina...........I just wanted to send you these photos and to thank-you for putting together such a beautiful arrangement for me...........I love it and my husband Pat was very impressed with your lovely work.........hope to see you again soon with another project. 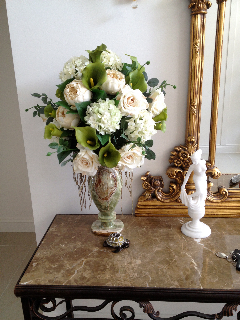 Kind regards........Sandra B…" - Photo of Sandra's artificial flower arrangement. I wanted to thank you for the beautiful arrangement I just received for my birthday. My mother, Margaret Noonan has taken me to your shop and I did get to meet you and your daughter a short while ago, but thought you would like to get some feedback that you do such a wonderful job. I just wanted to say a huge thank you for the wonderful service. Your website is very easy to navigate, you had the exact product I was after and the order was so simple to place. I cannot believe how quick the order was received and now sent to the recipient. You have been the best online flower shop I have ever dealt with and will be suggesting you to all my family, friends and colleagues. Sharing a text message from our happy customer sent to our even happier courier. "Good afternoon, My name is M...... from G........ Cct, Hope Island. Thank you very much indeed for your phone calls yesterday to arrange access to my home whilst I was out. I really appreciate your kindness. The flowers are a gift from my husband who could not be here with me and thanks to you I received them on my Birthday. Not all drivers are as considerate as you. Thanks again and regards. Have a nice day." I just wanted to thank you for the beautiful orchid which you delivered to my mother earlier this week at Spendelove House. She was absolutely thrilled with its beauty and said that every nurse and every visitor she has has remarked on how beautiful it is. One nurse has taken your details because she wants one as well. Thanks again for supplying such an elegant and obviously good quality plant. I must thank you for the magnificent arrangement you must have done for my Brother and His wife. I haven't seen them, but everyone who saw them said they were gorgeous. My mum saw them and said they made the other bouquets look like weeds!!! Thanks again Hannah, when I need flowers on the Gold Coast again, I will always use your store. My nephew seems to be making slow progress and I am coming up tonight for the weekend anyway. I just wanted to say thank you for the beautiful flowers you did for the High Tea on Tuesday. They were so pretty and exactly what I had in mind. I'm thinking I may order something similar for my Christmas dinner table at home!! Thank you Tina for the wonderful flowers. I sent the Abundance arrangement to two of my clients and they said they were magnificent and the largest arrangement of flowers they had ever seen. The fragrance is awesome. I will definitely be using Botanique again and recommending you to future clients. Rarely do you find a florist with such beautiful flowers. I don't know how you make your flowers last so much longer than other florists but I am glad they do. Thank you for your outstanding service today. I have just heard back from my friends and they are raving about the custom made bouquet you designed for me. They said the roses are beautiful, the silk wrap is gorgeous and they love the little crystal jeweled buckle. I can't thank you enough for your wonderful customer service. Please put photos of your work on your web site, they are so much better than these. Thank you for looking after my friend at the Homestead Nursing Home. Thank you for looking after my friend at the Homestead Nursing Home. The flowers were beautiful. They have grown huge and are looking amazing, in fact I have never seen such gorgeous tulips. A week ago I sent this bunch of tulips I was a bit worried when they arrived with small flowers still a bit greenish, but I can see now that it is the only way to buy tulips. Flowers are still lasting, 7 days later. Thanks for the flowers, I stopped by my friends’ house yesterday and they are still looking great. I love that your flowers always last, you never let me down. Thanks for ordering in the sunflowers for my anniversary. They were the flowers you arranged for our wedding. It's now 10 days later they are still looking good. Thanks for your great service as always! (I am Asha's old flatmate). I must say - your products never fail to amaze me and also the recipients. I love your web site, I have been searching for a good florist on the Gold Coast and you have come up as the best. I have been buying flowers from you for over 10 years and they are still the best. My mom loves your flowers. *Family happy because flowers looked great and still lasting 8 days later!!! Nice florist, flowers exceeded expectations, delivered on time, good communication. I am always nervous about ordering online and I just wanted to thank you for making the process such a pleasure. Thank you for sending the arrangement of Australian flowers to my nan, it was a good surprise. She has never had flowers delivered before. Flowers are still alive 3 weeks later. The flowers came as a real surprise and she loved them. I rang up yesterday and ordered these tulips. Just wanted to let you know Sandra loved them. They are her favorites. Thank you for organizing them so quickly for me. Thank you for delivering this basket for me. They are really nice. Nevin was right, they are the nicest roses, I have ever seen. Thank you Flowers by Tina! Thank you very much for the gorgeous flowers for our wedding day, we had a lovely day and many people commented on how lovely the flowers were. Thankyou for the gorgeous flowers you did for myself and my sisters. They looked amazing and I was so happy with the beautiful job you did. Thank you so much for making the perfec bouquet of tulips for my mum in Pacific Pines at such short notice. It just made her day. Thank you for helping in conveying my Dad's love to her on this special day. how spectacular these flowers were!!! trying to get to at the beginning of the year. I just wanted to thank you for the beautiful flowers and centrepieces that you and your staff created for my wedding day. You were very easy to work with and made everything very easy. I will definitely recommend Flowers By Tina to anyone needing a florist ! Bouquets and table arrangements were beautiful! We would like to say thankyou for all the work and skill that was put into making Belinda and Rodger's day so memorable. The bouquets and table arrangements were beautiful and admired by everyone. Thanks for the orchids I sent to my Uncle, they are his favorite. He loved them. BTW, he got the yellow ones. I just wanted to say thank you for your patience helping me yesterday. I was a little unsure of how these would look, they have arrived and look lovely. My Dad is very happy. Not big on leaving reviews! Had some roses sent today. You guys are the only web site that I could find who deliver living plants. They arrived as ordered, thanks. We received lots of flowers for our fathers passing and I wanted to let you know that your flowers lasted the longest. It is now nearly 3 weeks and they are still looking good. These flowers lasted the longest of all of the flowers I received but the yellow pollen has stained my table cloth. Please provide cleaning tips on your site! Thank you for the amazing flowers that you delivered for me. We love the sparkly glitter you sprinkled over them. GORGEOUS! Thank you Tina for your care and attention, Karin just adores the flowers and the fragrance has filled our house. See you next time I need flowers.